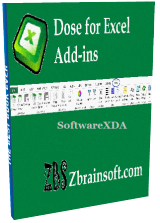 Dose for Excel is a powerful, feature-rich add-in for Microsoft Excel, which allows you to quickly perform functions that would otherwise take up much time. The tool integrates with the spreadsheet editor and allows you to easily access its features from the command ribbon. NB: All installations issues since the first giveaway have been resolved.